If you’re a carrot cake fan and a pancake lover, we might have just created your all-time favorite recipe. With warming spices like nutmeg, cloves and ginger and a coconut-cream cheese frosting flavored with maple syrup and cinnamon, this breakfast is as comforting as it gets. For the batter, we use whole-wheat flour instead of all-white flour, which means added dietary fiber. The pancakes get their moistness from the addition of unsweetened apple sauce, which also contains fiber as well as vitamin C.
With 209 calories and 11 grams of sugar per pancake, you’d be wise to save this breakfast as an occasional special treat. 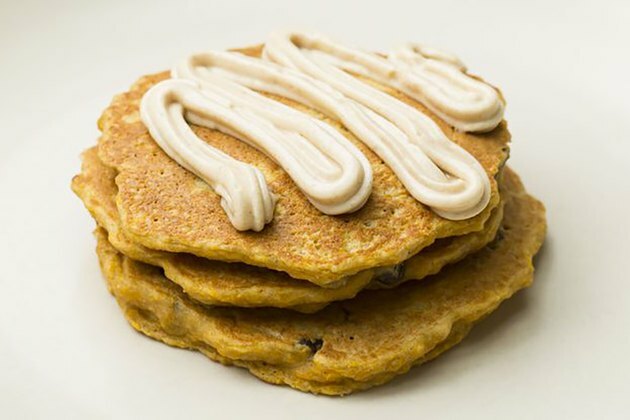 That being said, the recipe gets its sweetness from natural ingredients, including maple syrup, raisins and carrots, so don’t stress about indulging in these pancakes every so often if you’re craving a cozy morning. Remember, these homemade pancakes are so much better for you than the processed sweets you’ll find at a breakfast chain. For reference, a Cinnabon Classic Roll has 58 grams of sugar per serving, and a Coffee Cake Muffin from Dunkin’ Donuts has 51 grams. You do the math.